EK Water Blocks releases new EK-FC GeForce GTX FE water blocks for NVIDIA’s GeForce Founders Edition graphics cards. The EK-FC GeForce GTX FE is compatible with GTX 1060, 1070, 1080, 1080 Ti, Titan X Pascal and Titan Xp Founder’s Edition cards. 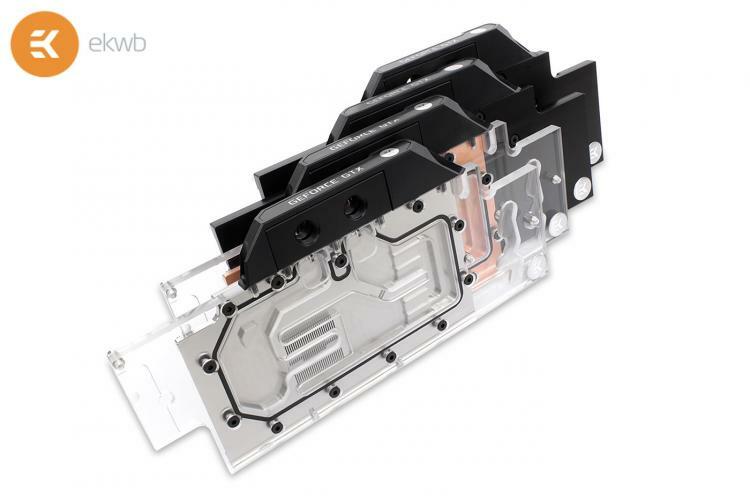 The new water block also features the recently introduced terminal cover which features improved aesthetics over the previous generation water block which are the GeForce GTX 10×0 / TITAN X Series water blocks. EKWB offers the new EK-FC GeForce GTX FE in four variants. The water block is a full-cover block that directly cools the critical areas of the graphics card including the graphics processor, RAM chips and the VRMs as liquid cooling flow directly over these areas. With the superior cooling of the EK-FC GeForce GTX FE, achieve higher overclocks with greater stability with ease. The water block features a central inlet split-flow design that offers the best possible cooling performance. The water block also works with a reversed flow offering the same cooling performance. The water block is made of electrolytic copper, bare or nickel-plated depending on variant. The top is made of either acrylic or POM Acetal material depending on variant as well. The water block has two 3mm LED diode holes for lighting upgrades. Screw-in brass standoffs are pre-installed and allow for safe, painless installation procedure. See the four variants below.